Given that so many of us have been metaphorically ravaged by the 'beast from the east' this past week, I figured the Saturday Blog might as well go completely Siberian. I've even been re-reading 'From Russia With Love', my favourite James Bond adventure and favourite Ian Fleming story after 'Chitty Chitty Bang Bang'. Yes, we've had a cold snap; and yes, it's been very difficult for those who've been on the receiving end of the worst of it...but if you think it's been a tad chilly here in the UK at just below freezing - that's about 7C lower than is typical for the time of year - then spare a thought for all those living in Russia. I've worked in Moscow in the winter when -25C is quite normal and people just wrap up well (lots of furs) and get on with life despite cold and snow. 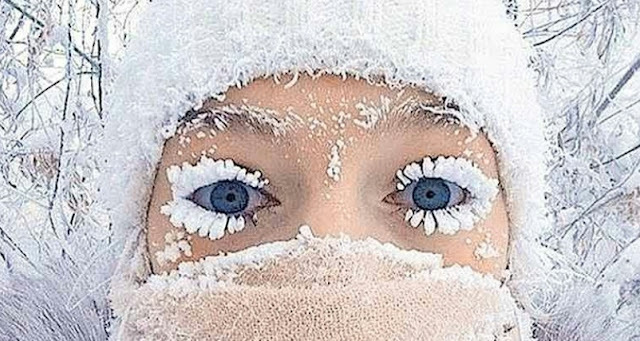 However, that's nothing compared to what those hardy souls living in the beast's lair, the remote Siberian region of Yakutia 3,000 miles east of Moscow, have been putting up with this winter as temperatures have plunged as low as -62C! That's proper cold - enough to ice up eye-lashes (see below) and to cause frostbite on areas of skin exposed for longer than five minutes. A Siberian 'winter' typically lasts nearly six months, from mid-October through to mid-April with temperatures averaging -30C to -35C at this time of year - so the fact that it has been colder than -50C for several weeks is unusual and has caused Siberia's Ministry of Emergency Situations (love the name) to order the closure of schools and to advise citizens not to use private vehicles or make long journeys. The fact that the UK has been impacted by very low temperatures, biting winds and snow storms is apparently the outcome of an unusual meteorological twist caused by a combination of the Coriolis Effect, Stratospheric Sudden Warming and Storm Emma. The Coriolis Effect (a result of the Earth's rotation) deflects south-moving polar winds westwards, producing the northern polar jetstream; Stratospheric Sudden Warming has recently caused the northern polar jetstream to twist back on itself, drawing in additional cold air from Siberia...and when that supercold airflow collided with Storm Emma in the week, the result was freezing winds and heavy snowfall over large parts of Britain - though we saw none of the latter in breezy Blackpool. Given it has been unusually chilly, it's a good job we have a steady supply of gas shipping in from Russia to help keep us warm in our houses! Because Siberia is so cold for so long, large areas being taiga or tundra, it means that dead creatures have been relatively well-preserved, frozen in the ground, for thousands of years - that includes mammoths and human beings. They co-existed in the region about 10,000 years ago. Back in 1993, the mummified body of a young woman was excavated from a frozen tomb in southern Siberia, close to the Chinese border. She was found buried with three horses and various artefacts to serve her in the afterlife, including cannabis! Labelled the Siberian Ice Maiden (alternatively the Altai Princess), she was so well-preserved that the tattooing on her skin was clearly visible, as was the cause of death from breast cancer, at the age of about twenty-five. She was buried in a silk shroud within a decorated wooden coffin. It is thought she was of noble birth and lived approximately 2,500 years ago (500 BC). Were she to come back today she would probably find that life in that bleak, agrarian-nomadic part of the world has not changed fundamentally: summers are short, winters are long and cold, survival is a perpetual struggle. in your short time on earth? as well as a warrior? of sun and carefree happiness? That's a lovely poem, Steve. Your poetry is so very touching. Big softie! Just when I was beginning to feel warm again! LOL. I think I followed the meteorology. Very interesting blog & a moving poem. Ha Ha - guilty as charged, Adele. I just want everyone to be happy! Most enjoyable read (it's +30C here!). An interesting blog and I like your poem but I don't trust those Ruskies! Yes Steve very good, thank you. Great poem, lad. Have you heard about the woolly mammoth skeleton at Oyston Towers? Unbelievable. And then there was 'novichok'! Yes, novichok - unfortunately the gift that keeps on giving! A great piece of writing and a really lovely poem.